When planning your next snorkeling trip it is often beneficial to have your own gear. Snorkeling provides a much desired view of the underwater world. A sport that is enjoyed by just about everyone, having your own snorkel gear will allow you to snorkel more often. Even the best swimmers can tire from long snorkeling trips. That is why it is best to opt for the best snorkeling fins. This will allow you to spend longer amounts of time in the water without leg cramps or tiring. 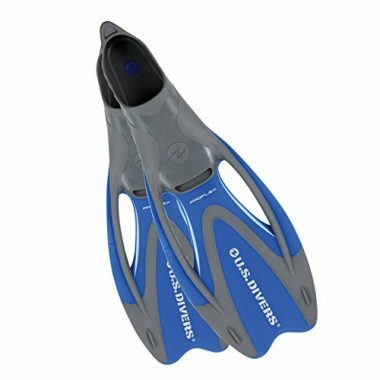 We have found and listed this year’s best snorkel fins on the market. These fins will ensure that your next trip in the water is much more enjoyable. This comfortable flipper has an open heel design with an adjustable heel strap. This works to ensure that your feet will fit comfortably in this fin. No need to wear a sock, this flipper will not chafe against your skin. 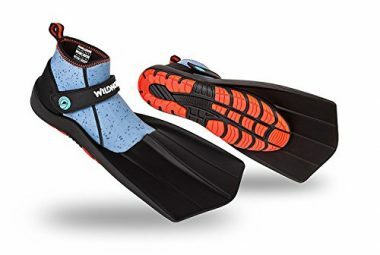 These short fins are great for travel. Delivering a powerful and efficient kick means you will not have to work as hard when swimming amongst the fishes. This short snorkeling fin is incredibly flexible and can fold in half for easy storage. A self adjusting foot pocket allows you to have the perfect fit that sits comfortably against your skin. The durable blade produces a powerful kick that propels you through the water without the dreaded leg cramps. This blade features highly reactive materials that guarantees an agile and effective kick every time. With a lightweight design traveling with these short fins becomes even easier. An array of sizes and colors makes this flipper set a great buy for the whole family. 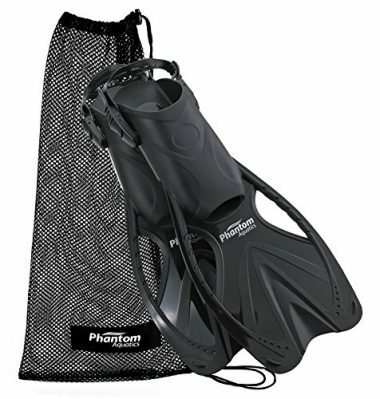 These swim fins for snorkeling comes with a mesh drawstring bag for quick drying and easy transport. A sharply designed blade responds well to any style of kick. An open heel design makes this fin an excellent option for those with wide or big feet. The adjustable strap and large open foot pocket allows this flipper to fit your feet even better than before. These fins have vented blades. This propels water back with every downstroke which enhances your kicks power. A superior snap and thrust fin allows this fin to move through the water with speed and agility. The long blade produces a powerful stroke sending you through the water with ease without resulting in fatigue. U.S. Divers has 65 years of experience which allows them the confidence of including a two year warranty with these flippers. An open heeled design with the adjustable heel strap allows you to have a guaranteed comfortable form fit style. A mesh drawstring bag is included in this packaged deal making transporting your fins easy. It is also fast drying ensuring your gear stays fresh. 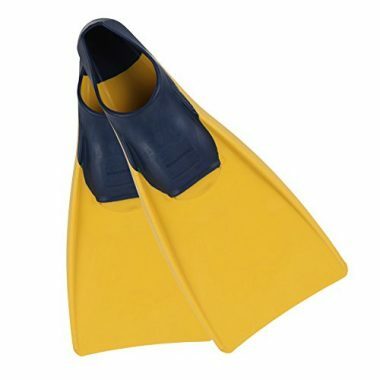 These top rated snorkeling flippers are made using buoyant materials that help you to float through the water. The compact length is great for travel making this an even better buy. Coming in a wide array of sizes between 3-13. The comfortable full foot pockets hold your foot tightly giving you a comfortable and secure hold. These molded flippers may be extra long but they do not sacrifice their lightweight design. Covering 20% more surface area means that your kick will get you farther than ever before. A non-slip foot pocket helps your foot to sit securely in the flipper. The comfortable and stretchy design allows your foot to be comfortable for longer. The light and reactive material used to construct these flippers produces a sharp snap motion that is incredibly powerful. The foot pocket sits along the bottom of the blade to provide protection even in shallow waters. This lightweight, compact snorkel fins for travel is easy to bring with you everywhere you go. The stiff snap of this fin delivers an extremely powerful stroke with every kick. The soft and comfortable foot pocket holds your foot still while the adjustable heel strap gives you a precise fit. 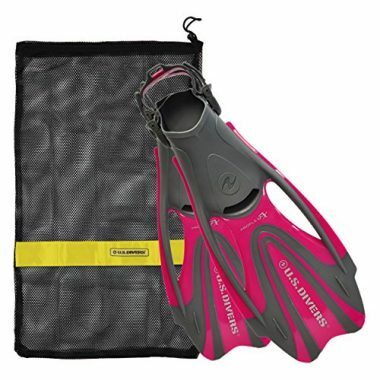 These flippers come with a mesh bag that make traveling with these fins even easier. Available from men’s sizes 5-13 means that this fin is guaranteed to fit a wider range of swimmers. The long blade propels you through the water quickly by delivering an enhanced snap and thrust motion. The full sized soft foot pocket gives a comfortable and snug fit securing your foot. Center flex zones cup the water to provide a more powerful kick. A two year warranty gives you the assurance that you are making a good purchase. These wide and comfortable flippers are easy to get on and off and the heel strap shapes expertly to the curves of your foot. The sharp material provides more thrust per kick. This snorkeling fin has an extended sole plate that adds the power that you need to get through the water faster. This relieves all strain on your legs and feet during your swim. An optimized hinge point corrects your fins shape throughout every motion of your kick. To round off this packaged deal, these flippers come complete with a mesh carrying bag. 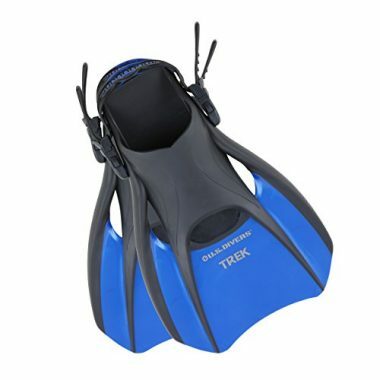 These long sleek snorkeling fins excel in both comfort and style. The soft foot pocket allows your foot to sit comfortably. The open heel design gives for a wider range of fitting for your feet. The V-Flex fin has a pre-bent design for a natural kicking motion. Sturdy side rails chanel the water pushing it backward and propelling you forward with ease. This allows you to snorkel for longer without fatigue. These long fins come with a fast drying mesh bag secured with a drawstring for easy transport. There are many key features that you should know about before deciding on the best snorkeling fin for you. This is the most important key feature in determining the type of snorkeling fin that is best for you. Whether you decide to opt for a full foot or an open heel design, it is best to start by learning your foot size. These are designed to be worn without the use of socks. This barefoot design is excellent for snorkeling in warm water. These fins typically tend to have shorter blades and have a lighter weight than full foot fins. For this reason, they are better for traveling. 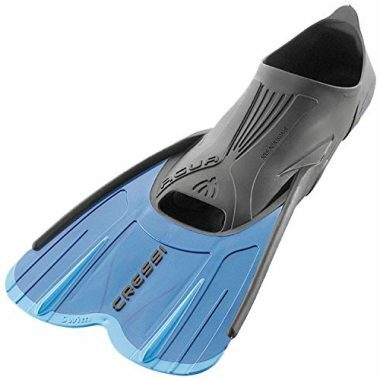 These fins are often worn with booties as the heel strap can cause chafing on your heel. This makes them perfect for cold water swims as the socks will add warmth. 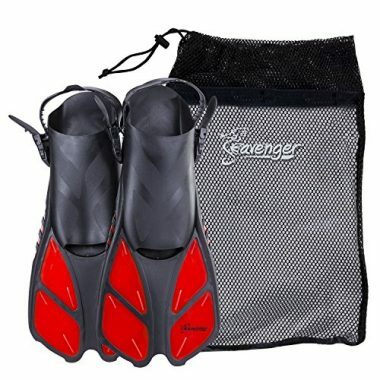 This is great for snorkeling sites that require a long on shore trek as they protect your feet. This style is much more popular than their closed toed counterparts as they fit a wider range of feet. There are two main types of blades for snorkeling fins. Split fins provide the same, if not more, propulsion as blade fins. This requires you to use less effort and therefore allow you to swim for longer. Paddle fins on the other hand have a stiff single blade design that requires more leg muscles to get you moving. Long fins tend to propel you much faster through the water and require much less effort. These are great for beginners as they move you much faster than their short fin counterparts. Short fins on the other hand produce a lot of power with every kick while being compact in size and therefore easy to travel with. There are many ways to customize your snorkeling fins to ensure that you get a pair that appeals to you. Most are available in many different colors. This will allow you to get a personalized look to your snorkeling experience. Flippers also vary in price so finding a good deal and sticking to your budget is easier than ever before. The different styles available will allow you complete control to ensuring you get a quality pair of fins that work well for you. Some people think that all you need to know when snorkeling is how fast you can get in the water. While we appreciate that level of enthusiasm but having a bit more knowledge about the sport will definitely prove useful. To help with your burning questions we have answered some of your common snorkel related questions below. Q: How To Use Snorkel Fins? A: Fins should be an extension of your body. But with that being said they will make your body move in a different way. Instead of small, short kicks, you should make your legs take large, smooth movements. This will make you move with less effort. Also, when you need to move fast these large movements will propel you farther with much less effort than without the fins. Q: How Should Snorkel Fins Fit? A: Your fins should fit comfortably without squeezing your toes. If you stuff your foot into a small size it will make your foot feel uncomfortable and can cause cramping – something you want to avoid when swimming. The boot should be snug without extra space. If your foot is too small for the boot it will move around which can blisters and chafing. Q: How To Size Snorkel Fins? A: Much like fitting shoes, your foot should be supported and comfortable. This should be the case no matter what kind of fins you have. Snorkeling should be a comfortable, even relaxing, time. Keep in mind that some fins have an adjustable strap which secures your foot in place. 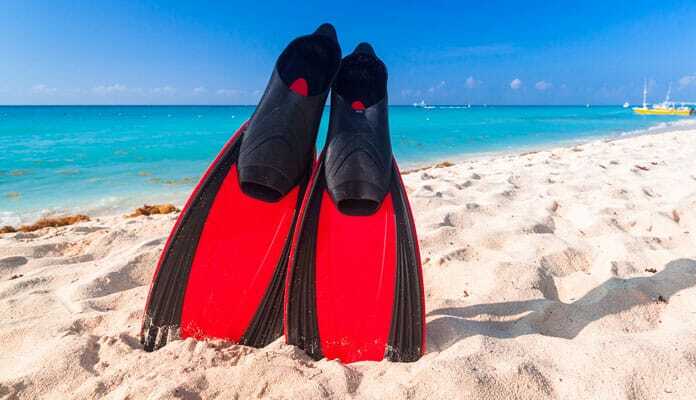 If you have a similar size foot as some of your family or friends, you may be able to share a single pair of fins by adjusting the strap to suit their foot. Q: How Do I Properly Wear Snorkel Fins? A: After ensuring that you have the proper size and style of fin, you will want to see if your fins can be worn on their own, such as with a full foot design, or will work best with a sock, such as with an open heeled design. It is most often recommended to put your fins on as close to the water as possible. Once on, walk into the water backward or sideways. This may look and feel silly but it will reduce the chance of breaking the blade. Once in the water, allow your fins to do all the work. There is no need to use your hands, in fact, it will actually slow you down. Try folding your arms across your chest to help remind you not to use them. You will want to kick using a small and graceful straight legged kick. Use the whole leg rather than just the part below your knee. The idea is to glide floating across the surface so be sure to keep your legs moving slow and strong. Q: How Do I Clean Snorkel Fins? A: Like all saltwater gear, cleaning your fins after every use is incredibly important. When you are done using your fins it is important to clean them. Ideally, cleaning your fins is something that would be done every time you leave the water, but at once you are leaving the water for the day is fine as well. The actual cleaning is easy to do. Simply rinse your fins thoroughly with clean fresh water and allow them to naturally air dry out of direct sunlight. When storing your fins it is important to keep them straight and not on their tips. You can do this by laying them flat or hanging them by their strap. Q: What Is The Difference Between Snorkeling Fins Vs. Diving Fins? A: Contrary to popular belief, there is a difference between snorkel fins and diving fins. When you are in the water you want to ensure that you have the proper fins to make your snorkel experience as easy and pleasurable as possible. Different fins are made for different water depths. They are designed for use at shallower depths they are made quite a bit shorter and have fewer features than those found for diving. These fins are typically are a full foot design to eliminate the need for socks. 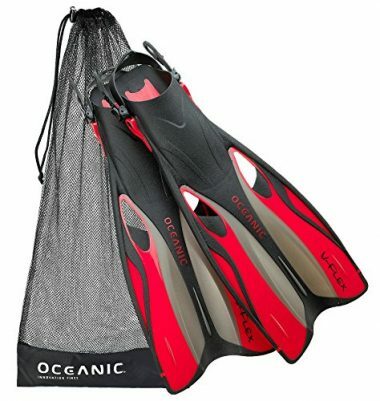 Scuba fins have a lot more features than their basic partners to help you kick further and battle stronger currents. Typically sporting an open heel design these complex fins come at a longer length. The longer length allows you to generate more power with each kick. These fins typically feature channels that allow the water to travel through the fins. Properly caring for your fins will ensure that you get more wear from your fins. This will greatly increase the lifespan of your gear. After every use we recommend you rinsing your dive fins with freshwater. Using warm water works best as it will dissolve all of the salt particles on your gear. Once washed ensure you air dry your flippers to avoid a mildew smell. This can be done in a mesh carrying bag for ease of travel. When not in use, store your gear out of the sun. The sun will cause the lifespan of your flippers to greatly decrease. When storing your gear it is important to store them flat. This will ensure that your gear doesn’t have a permanent bend or fold in them thereby increasing the integrity of your gear. When snorkeling with fins you will be able to go for much longer than without. Avoiding foot and leg cramps can be incredibly desirable. 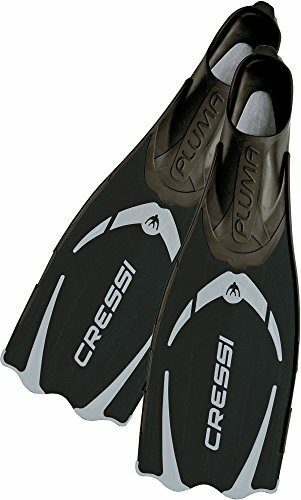 Snorkeling fins reviews agree that no matter the size of fins you opt for, you are guaranteed to enjoy your adventure much more when wearing flippers. Any of the top 10 snorkel fins that made it on our list will ensure that you get the most out of your underwater experience. Do you use a pair of snorkeling fins that made it on our list? Let us know how it has improved your snorkeling experience in the comment section below.